The main brass plaque was added in 1796, funded by public subscription organised by the Reverend James Watson. As the text implies, 'Sambo' died about sixty years earlier, though some records suggest it was in 1720 rather than 1736. That means the grave was unmarked for at least sixty years, so it's quite conceivable that the true name of the interred was forgotten and the Rev. Watson chose a common generic slave name, 'Sambo' (originally denoting mixed race, apparently), which his audience would recognise. 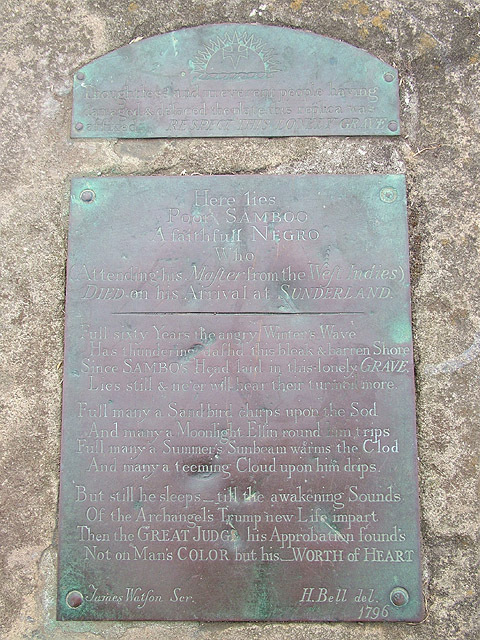 Note that the inscription initially says 'here lies poor Samboo', but later clearly calls him 'Sambo'. It's unclear which, if either, was his actual name. As mentioned above, the latter was in common usage. The inconsistency could even be poetic licence, or simply a result of eccentric 18th Century spelling habits – 'faithfull' and 'color' are also misspelled. Whatever the explanation, there's no doubt that the established traditional name of the location is 'Sambo's Grave', definitely not 'Samboo's'.